Trixter guitarist Steve Brown will perform with Def Leppard for their remaining 2014 performances in place of Vivian Campbell. Steve is a good friend of Phil's and has regularly attended Lep shows as far back as the X tour at New York's Beacon Theatre where he and Phil posed for backstage photos. He posted the news about one hour ago on twitter - see below. In a twist of fate Steve's first show filling in for Vivian will be at Wembley Stadium. The last time Lep played there on 20th April 1992 was Vivian's first major public appearance with the band following a warm-up gig in Dublin. He will then join them for four US shows in Las Vegas, Santa Ynez, Rancho Mirage and Temecula. Trixter formed in 1983 and stayed together until 1995 when they split up. They later reformed in 2007 and have recently released an album called 'New Audio Machine' (2012 on Frontiers Records). They plan to release another album in 2015. The debut album 'Trixter' went Gold in the USA, reached #28 on the Billboard Top 200 and featured the singles 'Give It to Me Good', 'Surrender', and 'One in a Million'. Steve has actually played live with one member of the band before - Phil Collen. 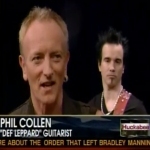 Following Phil's unlikely jam session with US politician Mike Huckabee at the January 2011 NAMM trade show the two met up again on the 7th March edition of his TV show. Phil played 'Pour Some Sugar On Me' backed by Steve Brown and drummer Kyle Fiero. Watch the performance below as posted by brandootr. "PHIL HERE>After a cool jam session at NAMM I have been invited back to jam some tunes with Mike Huckabee TODAY live on his Fox news show. I'm bringing a couple of friends along: Steve Brown accompanying me on guitar and Kyle Fiero on drums. Check your local listings for today's show times..."